Please note that the content of this book primarily consists of articles available from Wikipedia or other free sources online. 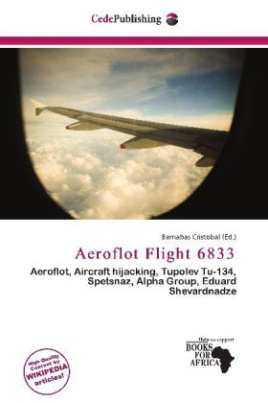 Aeroflot Flight 6833, en route from Tbilisi, Georgian SSR, to Leningrad, Russian SFSR, with an intermediate stop in Batumi, was the scene of an attempted aircraft hijacking by seven young Georgians on 18-19 November 1983. The crisis ended with a storming of the Tu-134A airliner by Soviet special forces that resulted in eight dead. The surviving hijackers were subsequently tried and executed. On 18 November 1983, seven young people, all sons of Georgian intellectual élite families attempted to flee the Soviet Union by hijacking an airliner of the state-run Aeroflot company.